This entry was posted on July 2, 2015 by Jessica Anderson. Twinkle twinkle little star is the inspiration for giving this award. The engraving says "EMT and children everywhere Thank You!" "Our Board of Directors serves to guide our group. 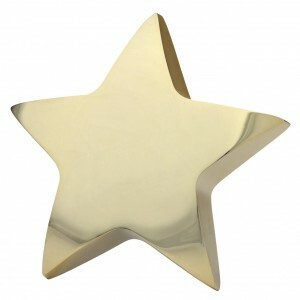 As a board member rotates off their years of service, they are honored with the Star Paperweight such as the ones I just ordered. As we serve teachers and try to keep our tuition costs low, we are a very low-budget group without a physical headquarters. We lovingly call ourselves a “just add water” Institute of Education and Research since members of our teaching staff arrive at a course site and launch a course of study for that particular group of educators. We currently sponsor courses in Michigan, Illinois, Texas and California. This July we gather in Chicago for our annual week of summer study. The star paperweight is significant to our group since one of the 130 or so songs we use in our study includes, “Twinkle, twinkle little star.” While I used to think of this song as just simply child’s play, I have come to know that given the right setting, Twinkle can become a lovely work of art. It's an honor for us to create awards for an organization making a positive difference in children's lives! We are humbled to be making awards for the special people serving on their board. To find out more about Education Through Music and the work they do for teachers and students, visit their website. Thank you Quin for sharing your story!